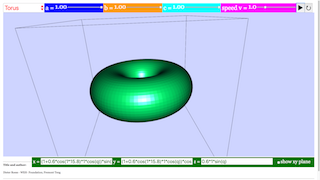 This function plotter displays animated 3D surfaces described by three coordinate functions of two variables p, q for the spatial coordinates x, y, z. The coordinate functions fx , fy , fz , which in the simulation are shown in three editable text fields, map the points of the plane pq unambiguously into a surface in space xyz. If fx , fy ,, fz contain periodic functions of the parameters p and q, closed or intersecting surfaces may be produced. The functions may contain four constants a, b, c, v that can be changed by sliders. In the predefined functions v is used to animate the surfaces by oscillating one or more of the coordinates via time dependent terms. At the start of the simulation you will see the projection of a plane in space, viewed under perspective distortion. It is embedded into an x y z tripod, and is accompanied by the x y- plane z = 0. This plane can be deactivated by its check box. Other predefined surfaces in space can by selected in the ComboBox. The formula for the plane (pi ≡ π) shows that v modulates the z-function periodically: z = cos(vt)(a - 0.6)p. For t = 0 the modulation factor is 1; a determines the degree of modulation; (a- 0.6) defines a reasonable initial value. The other variable constants b, c are not used with the plane. Play starts the animation, with time t starting at 0, as indicated in the t number field. With cos(t) fluctuating periodically, the plane oscillates in space. Slider a defines the base orientation. Pause freezes the animation at any spatial position. Reset leads back to the initial conditions. The range of p and q is ∓ π . Scaling of all three axes x, y, z has a range of ∓ 1. The xy-plane cuts the z axis at the center of the z- arrow. As variables p and q change in the range -π to +π, a periodic function as cos(p) completes a full period in the variable plane. Other ways of visualization are described in the next page. Predefined functions are selected in the ComboBox with a mouse click. Constants a,b,c can be varied by sliders while the animation is running. By editing the formulas you can change the terms that are animated. You can input new parametric formulas to create your own surfaces. Do not forget to press the ENTER key after a change! Touching a surface with the mouse pointer lets its color filling disappear; the wire mesh of calculation will be pronouncedly visible. As p and scale in pi (π), for all terms where p and q enter directly into formulas for x ,y, z (e.g not in periodic function of the variables), a factor 1/pi (1/π) appears. A factor cos(v*t) indicates that the associated term is animated. Reset redefines t = 0 and hence cos(vt) = 1. Fixed numbers in the formulas are used to define a reasonable scaling at the start of the simulation for uniform default values of parameters a, b, c (= 0.5). E1: Test the different surfaces without a change of parameters. Rotate the frames and train your 3D perception of these functions. E2: Study the formulas and develop a sense for the relation between formulas and surface. E3: Rotate, tilt and zoom the 3D projection to optimize the visual impression of the surface . Use the Camera Inspector, too (see Visualization page). E4: Vary parameters and study the influence on the appearance of the surface. E5: Change signs (+/-) in the formulas and study the effect. E6: Vary the grade of power functions in the formulas and study the resulting surfaces. E7: Edit the formulas freehandedly and consider in advance how that should influence the surface. E8: Animate different parameters, or two at the same time. E10: Reflect in using 3D surfaces created this way in design of 3D objects. The last three predefined functions are intended as encouragement (mouth and boat). Remember that numerical machines could directly use the formulas for control. Toggling through the combo box will give the various base shapes selected. Adjusting the sliders will modify their respective variables. and parse it as a new function. Checking this will toggle the visibility of the cyan xy plane. Note that it won't work if the simulation is playing.